Feminism has become a real point of contention and controversy lately. The word itself is like a loaded gun: it can kill or protect. But there is still a lot of misunderstanding about the movement and what it stands for today. It has evolved quite a lot since its origins in the late 1800s when the women’s rights movement fought for the right to vote. While we have a lot more freedoms and equalities today as women, there are many issues where we are not on equal footing with men. Women around the world are fighting for different things than say that of those in America. It’s not fair to generalize the whole movement as irrelevant because women’s rights literally mean the difference between life and death in some places. Closer to home in the states, it’s about fighting for fair pay, the right of a woman to make her own choices about reproductive health, and to fight against sexualized imagery in the media which grossly misrepresent the worth of a woman. On the career front, women are making great strides in all sectors, but there are industries which skew more in favor of men. Not that it is a man’s fault there aren’t as many women, say, who hold Computer Science jobs. It’s about women knowing the opportunities exist and having female role models to look up to and know what is possible. The STEM industries (science, tech, engineering & math) as well as typical male industries are slowly becoming more viable options for women because of the greater representation we see. Danae Mines, the trailblazing female firefighter from New York is showing other women that they do have the physical capabilities to do this job. 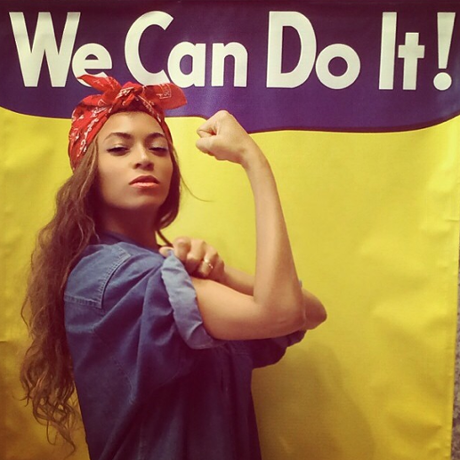 On a broader scale, Rosie the Riveter has become the unofficial icon for feminism today, even superstars like Beyonce have dressed up as her to publicly show their stance on feminism. But who exactly is Rosie and why is she such an icon? Rosie dates back to the second world war, a symbol inspired by the women who took up the factory and munitions jobs left behind by conscripted men, and whose work undoubtedly moved the feminist cause forward by decades. She was designed by J. Howard Miller who based the image off the male workers and made her feminine. The image represented a time in history which was a turning point for women. While they were still largely expected to take care of the household and children, women now realized that they could in fact do the “man’s jobs”, that they were more than capable, whether out of necessity or choice. Some say Rosie the Riveter is not a feminist icon because of what she originally represented, but we think today she is symbolic of the struggle that women have gone through and still go through, and she gives women hope that anything is possible. Today in the United States she is being used as a way to encourage the younger generation like never before. 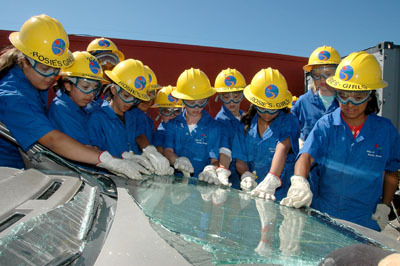 A 3-week summer camp called ‘Rosie’s Girls‘ which has 8 locations across the country is teaching young girls from grades 6-8 hands on experience with welding, construction, carpentry, auto-repair, STEM-related jobs, as well as a whole component related to self-esteem and positive body image. The camp was created by Vermont Works For Women which is an organization dedicated to helping women and girls realize their potential in life. 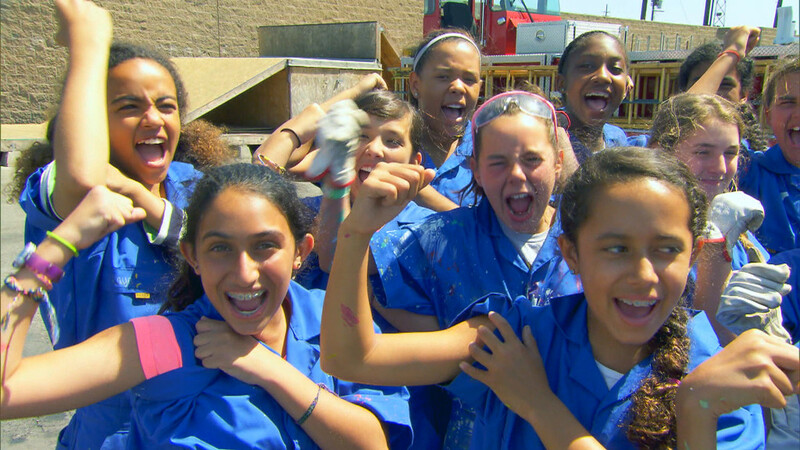 The Today show’s Maria Shriver visited the Santa Monica location to find out how Rosie, or the camp at least, is making an impact on girls in 2014. “The camp has really taught me that I can do anything a boy can do, and maybe I can even do it better,” one camper said. “I think it means that you’re more independent, you’re really brave and you don’t give up,” another said about being a Rosie’s Girl. As for the body image sessions, the girls learn to be honest and vulnerable about their insecurities, and they foster an environment where they support, encourage and build each other up, not just build construction. While this camp isn’t a “feminist camp” explicitly, it is giving these girls a wider scope of what their options are and giving them a taste of industries they may not be introduced to during their school years. That right there is a great example of why feminism is relevant. It shows women the areas of inequality, and it creates solutions and opportunities. Feminism isn’t about creating a culture of victim-hood, not taking responsibility, man-bashing or placing the blame on institutions solely. We recognize that we are just as capable of doing what men can do and need the space to contribute to everyday life. So here’s to all those feminists who are genuinely spending their time embracing their femininity, and working alongside men to reach equality.